NTR Metals (Northern Texas Refining) is a bit of an up and comer in the precious metals industry, and has quickly grown into one of the largest refiners and distributors of precious metals in the United States as well as abroad. By establishing a wide network of refining and manufacturing hubs across the world, NTR has gained access to a cheap and constant supply of metals, allowing them to produce high quality silver products at lesser prices than their competitors. In today’s day and age of razor thin margins, this has allowed NTR Metals to experience tremendous growth in a relatively short amount of time. NTR Metals is a part of the world’s largest precious metal refining and manufacturing companies with offices and plants in 74 locations around the world. The company is headquartered in Dallas, Texas, and they refine more than 30 million pounds of metal each year. NTR Metals works with a network of over 20,000 companies, but does not sell to the public. They are well known and stand as a reputable refining and minting business. NTR Metals is part of the minting process for all their precious metals products from the raw metals to the finished products. NTR Metal inspects all precious metals, and uses only the finest quality source material to mint their bullion products. They guarantee all their pure bullion and create each type for investors being particular about complete metal purity, accurate weight, and only the highest quality. 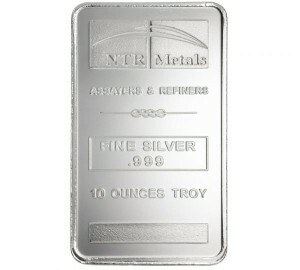 NTR Metals produces silver bullion bars in 1oz, 10 oz, 100oz, and 1 kg bars. Each bar is embellished with the NTR METALS logo and the weight of purity of the bar. All silver bars are hand inspected for quality before being packaged and distributed. They use a protective sealing process that uses PVC, polyvinyl chloride, which is radio frequency heat sealed. This packaging protects the silver bars from any physical damage and oxidation and the bars can be sold individually or in packs of ten bars. NTR Metal is an all inclusive refiner, minter, and marketer of precious metals. They use a trading system, NTR Metals Market Maker™ that allows all precious metal bullion bar dealers the ability to buy bullion at the best prices dictated by the market. This commodity allows the savings to be passed on to retail customers who purchase silver bullion bars and other precious metal products through local and online dealers. In 2012, NTR Metals merged with Ohio Precious Metals. OPM produces bullion from processing precious metals obtained by collecting jewelry, metal scraps from electronic manufacturers, dentists, pawn shops, and other resources. They process and smelter the metals to create the purest metal content and then mint it into bullion. This type of bullion is for investors, as it is a low cost method of obtaining pure, investment-grade metal. With this merger comes additional opportunity for consumers to purchase bullion bars and products at an even greater savings. The full services of NTR Metals combined with the industry experience of OPM will offer silver and other precious metal bullion at the lowest possible cost.